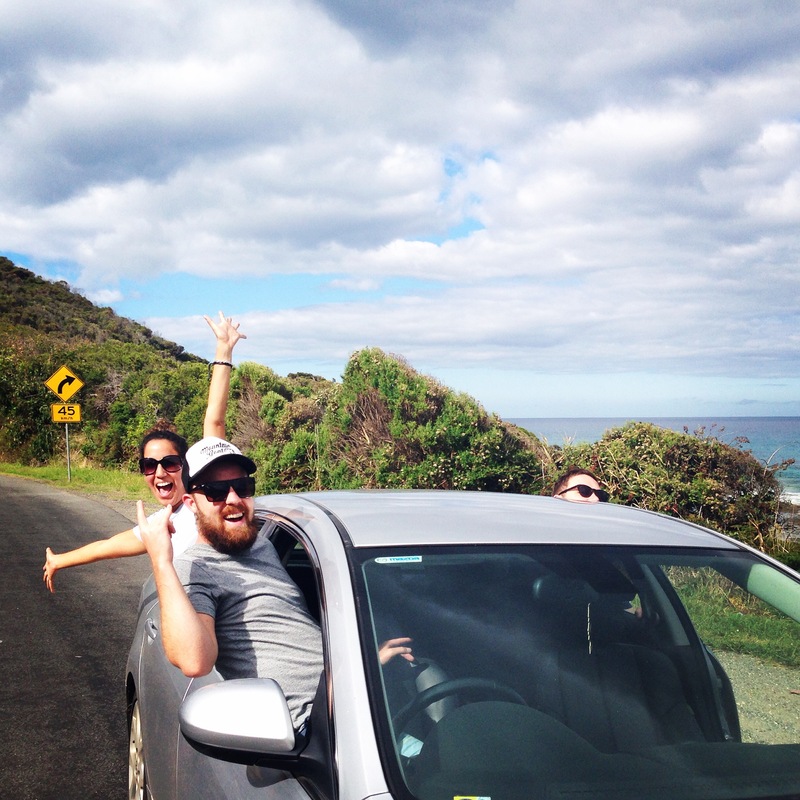 Adventuring the Great Ocean Road – These Two Eyes! “Iconic Australia,” they say. “Car stopping scenery,” they’ve boasted. “Breathtaking natural wonders,” I read. And it’s all true. The 243-kilometer stretch of road along Victoria’s Southeast coast is certainly to be admired. Even better, as a first timer I learned that what I like to lazily refer to as the GOR (Great Ocean Road) is the world’s longest war memorial; built from 1919 to 1932 in remembrance of those who died in WWI by it’s own returning soldiers. Just like them we had a plan. Luckily though we averaged more than 3 kilometers a month. Leaving early on a Saturday morning we took the highway coupled with some back roads and traveled inland for about 4 hours directly to Warrnambool, the largest city along the Road just near its start. From there, we slowly made our way along the coast back toward Melbourne while seeing what was on offer. And as far as Warrnambool is concerned I’ll tell you what’s on offer. Kermond’s Hamburgers is its biggest claim to fame and rightfully so! This old-school joint, still serving thick malted milkshakes in white aprons, was packed to the rafters. They keep the menu simple: burger, fried onions and bun. Customize it with normal stuff: tomatoes, lettuce, cheese or Aussie add-ons i.e. fried egg, beetroot, mayo. “Every bite of that vinegar jalapeno was like heaven in my mouth,” my Aussie travel companion slash foodie Nidya, slurred with her last bite. We left excited to officially start our GOR journey but were quickly disappointed once we entered Allansford Cheese World. 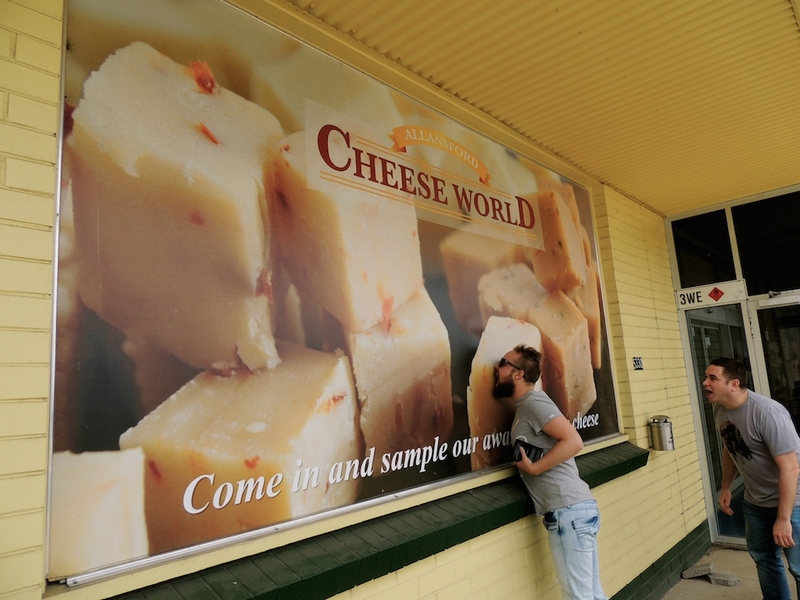 With a name such as Cheese World they set pretty high expectations. I mean, we practically did a 180 to get there as one would assume according to their advertising that there would be a monumental amount of cheese coupled with delicate wine tasting. What we experienced though was a service station, fast-food restaurant, Yellowtail retailer and tourist shop rolled into one. In the back, in the small room labeled Cheese, we were resurrected by delectable aged cheddars and somehow walked away with a varietal of 5 hefty wedges to consume over the weekend. We traveled on and just as we began to smell the salty sea air and the coast came into view the sky turned overcast and it began to drizzle. We pulled off at the first few scenic lookouts to get some early snaps in a foggy view of the cerulean ocean contrasted against amazing limestone formations. I was starting to panic that my once-in-a-lifetime opportunity to snap the much anticipated – the whole reason we drove for hours and hours – this is not really happening I’m sure it will clear up any second – no really, is it seriously raining – iconic rock formations would be ruined by fowl weather. Finally we reached the holy grail of Port Campbell, home to the famed Twelve Apostles (now actually ten) and “heart of the Great Ocean Road”. The tourist buses lined the parking lot and the selfie sticks were endless. I was thankful that I canceled the tour I booked six months ago and was here on my terms, or at least in a small group of intimate friends thanks to Wes’ amazing patience and driving skills. But we were fast about it while still taking it all in. My head unknowingly blocked endless selfies and my hair whipped against my face causing a uni-brow in nearly every picture. Just as we were about to depart and began walking away the clouds cleared and the sun shimmered causing the right light on the striking water. It was stunning. Camera out, I finally got my shots. We could conclusively rest for the evening. In Apollo Bay, our 4-bed lofted studio at Coastal Motel offered the right mix of comfort and location just across from the beach and walking distance to all of the charming restaurants and shops in town. Even better, we had a heap of cheese to consume along with boutique wine and beers we brought with us. In fact, the week prior I had just won a case of 14% (ABV) Jumping the Shark (Hungarian oak barrel-aged saffron’d imperial red ale aka intense) from Melbourne craft brewers Moon Dog and needed a team to consume them with. The Fonz couldn’t have done it alone either. Sunday morning we were back on the road heading inland to explore Great Otway National Park and the Otway Fly Treetop Adventures. Word to the wise, the winding, twisting, I-was-near-vomiting curves of the road to get there are to be cautioned about. But for real, my window was rolled down and my head was hanging out like a fatigued dog. $25 is a steep fare to walk on steel structures at the top of some trees and better value if you opted for their zip lining tours albeit for a much heftier price. We proudly boasted that between four of us we had zip lined in South Africa, Peru, and Laos so gave that a pass. But at 25 meters above the ground, the lush rainforest and distinct natural fauna made for a unique walk and we had no regrets for the experience, despite us nauseatingly needing to snake back the way we came once in the car. Further along the coast sat the most amazing pub in the small town of Wye River. Wye Beach Hotel is more than just a charismatic beachfront bar and restaurant. Its exquisite food, coupled with an unexpected local beer selection and epicurean wine list was remarkable. For a true quiet holiday off the grid I’d recommend staying at one of the small hillside lodges. We closed our evening off with a curry back at local yet upmarket Apollo Bay Hotel before our final stretch home the following day. Some of the best and curviest parts of the drive are around the quintessential beach town of Lorne. Shopping, restaurants, bars and beach – this popular spot with Melbournians was very busy on the sunny Monday. Luckily we were able to snag a table for breakfast at Lorne Beach Pavilion overlooking the beautiful sea to the sweet sound of children running and crying everywhere. Full on avocado smash, we parked ourselves at the edge of the sand and took in a few rays before continuing on and passing under the famed Great Ocean Road sign. Now here’s the best part of coming home. 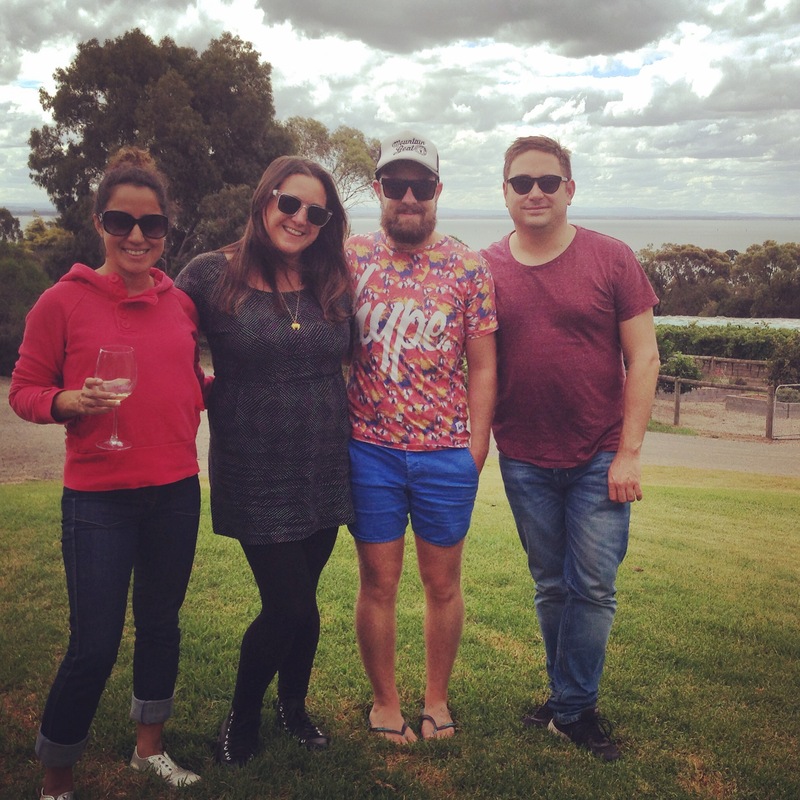 We missed out, or actually intentionally avoided the popular seaside towns of Anglesea, Torquay, Jan Juc and others on our way back to the city in order to side track to the Bellarine Peninsula just outside of Geelong.